As I’ve said on countless occasions, the local underground scene has never been as healthy as in 2017 and this weekend’s, Metal over Malta is the undying proof of that. Being in it’s 3rd edition, the name Metal over Malta Festival has established itself as one of the main international heavy metal events on the island, drawing in crowds from the local and increasingly foreign music scene. 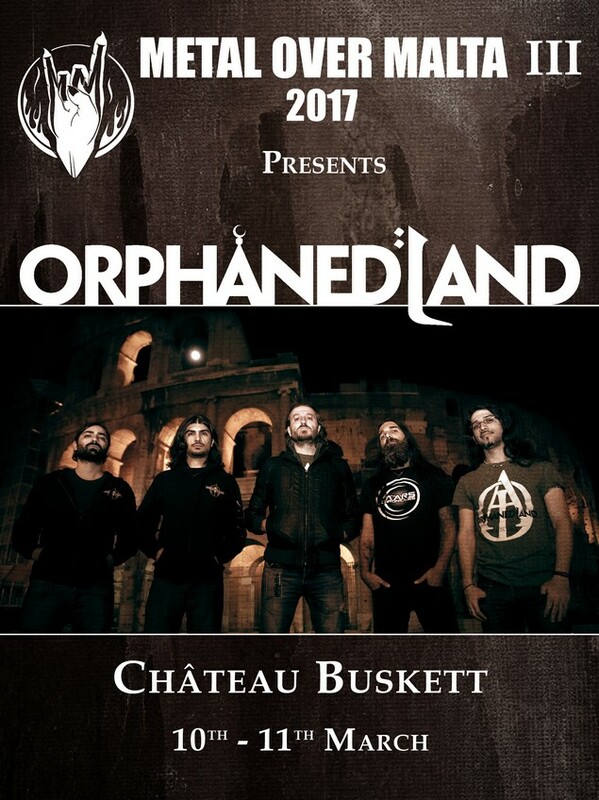 This year the festival has announced Orphaned Land as headliner, following in the footsteps of previous years and anchoring a major band on the bill. 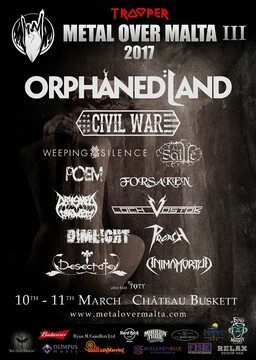 Previous years saw Septicflesh and Draconian. This year the festival also announced Swedish power-metal generals Civil War, co-headlining Friday night. Civil War is formed by none other than ex-members of powerhouse legends Sabaton, with Kelly Sundown on vocals, who to the Progressive Metal fans is known for fronting prog legends Adagio. 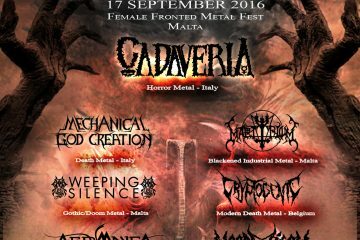 Most notably, the festival is clearly not inclined towards one genre of metal. On the contrary, the mission is quality, not style. If the band is drawing the crowds, delivering crushing performances and is an all-round quality act, then they’re being considered. This is true also for the smaller names. 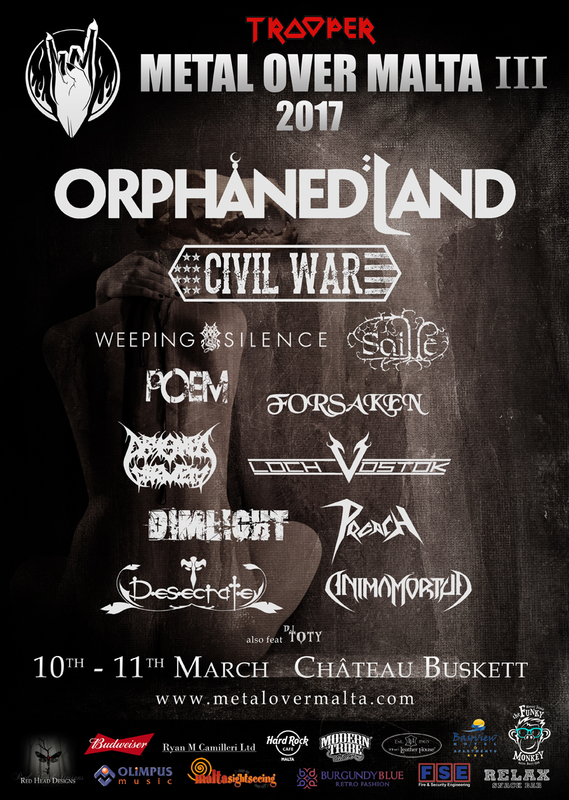 This edition, planned for Friday 10th and Saturday 11th March, will see 12 bands hit the stage from all corners of metal genres. The festival is proud to offer the stage to Maltese bands too, both established and growing. Indeed, they take a deserved place on the line-up. To-date no less than nine local bands were booked on the show. This third edition will see local act Forsaken holding the banner of Epic Doom Metal as they celebrate their 25th year anniversary, established brutal outfit Abysmal Torment, relative new-comers Animamortua who are making a name for themselves, as well as annual hosts Weeping Silence coincidentally also celebrating their 20th year anniversary! Anyone who has been to international festivals knows that the event is not only about headliners. Many attend the shows to see new or lesser-known acts … the savored festival-goer understands that just ‘coz s/he doesn’t know the band it doesn’t mean they’re not going to slay the stage. Nothing rings truer that what happened in the 2nd edition where Thurisaz, Shores of Null and Eyes Wide Open walked into the venue relatively unknown in local circles and walked out with a fan-base. This is what it is about! The element of surprise and discovery is important to any festival. This edition will see great bands, unknown to many locally and hailed as the next big thing in many other countries. Such is the case with Dimlight who’s show is amazing, Poem who played 38 cities on tour in support of Amorphis and regarded as one of Europe’s most talented Prog bands, Preach and Loch Vostok who are expected to give quite the show. Well-established symphonic extreme metal band Saille will also be releasing their new fourth album at the festival, so expect a killer show from them. With a few days left to the show, pencil the event into your diaries, book your leave and drag yourselves down to Chateau Buskett on Friday 10th and Saturday 11th. Tickets will be available at the door. A pre-party will be held at The Funky Monkey on Thursday 9th.